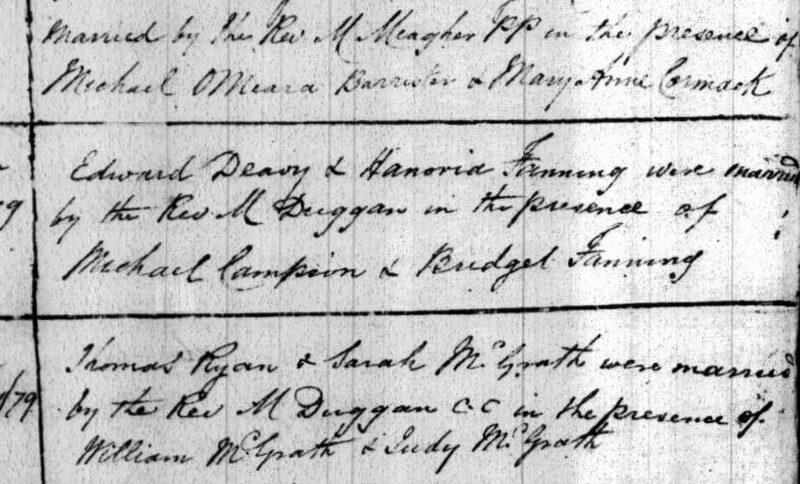 These marriage records are from the Catholic Parish registers now online, free, at the National Library of Ireland site. For Drom and Inch at The National Library of Ireland online site there are marriage records from 5 May 1827 to 16 Oct 1880. Rootsireland has earlier marriage records for this parish. For Drom and Inch they have marriage records from 1807 to 1880. I have included these records from Rootsireland from 1807 to 1827. The Drom Catholic marriage registers are unusual in that a lot of the time the priest wrote the address in the margin and the entries are easy to read. The most frustrating aspect of the Irish parish marriage records of this time is that the parents’ names were not entered. Marriages took place usually in the bride’s townland, so this address would be her family’s. These records are of use in finding female Fannings but of course the males were married in the woman’s townland so they are harder to track. Often “House” was written in the margin. I am assuming this is because the marriage ceremony took place in their house rather than a chapel or church but I may be wrong. Let me know otherwise. I am also including any marriages where a Fanning or Fannen or Fannon was a witness. My Fanning ancestors came from Lissaroon and there was only one Fanning family in Lisaroon as far as I know. Lisaroon was/is a townland of 296 acres near Thurles. In Grifiths Valuations there are 31 entries for Lissaroon. 25 June 1833, John Gleeson & Catherine Fanning wit: Honora Maher & Margaret Stapleton. April 15 1833, Thomas Doherty and Catherine Fanning wit: James Russell. Jan 24 1835, Lissaroon, Thomas Eviston & Mary Fanning wit: Rev J. Ryan & Martin Eviston. Feb 18 1835, Drom, William Rahill & Mary Fanning wit: Pat Fogarty & James Fanning. Feb 4 1838, John Bourke & Mary Fanning wit: Edmond Hunt & Mary Fanning. Feb 4 1838, John Bourke & Mary Doyle wit: Martin Fanning & Mary Purcell. *22 Feb 1838, Lissaroon, Daniel Morrissey & Catherine Fanning wit: Thomas Cormack & Cath Fanning. 5 Feb 1839, House, Patrick Fanning & Eliza Miller wit: Michael Doolan & Mary Glascock. 30 Jan 1839, Timothy Carroll & Bridget Cormack wit: Barnaby Banon & Judy Fanning. 10 Feb 1839, Killahagan, John Fogarty & Ellen Fanning wit: Kyron Campion & Ellen Nockton?. Feb 7 1841, Patrick Grant & Mary Fanning wit: James Cooney & Thomas Doherty. Jan 19 1841, Michael Mitchell & Johanna Fanning wit: James Max ? & Ellen Gleeson. Feb 2 1841, Joseph Fanning & Mary Long Wit: James Bourke & Bridget Ryan. 6 Feb 1842, Martin Eviston & Johanna Fanning wit: John Cormack & Bridget Bourke. 6 Feb 1842, James Fanning & Anne Bourke wit: James Fanning & Judy McDonnell. Sept 16 1844, House, William Loughman & Bridget Ryan, wit: Joseph Fanning & Judy Fogarty. Jan 22 1845, House, John Moroney & Ellen Fanning wit: Phill Carroll & Mary Cahill. Jan 30 1845, Lissaroon, Pat Ryan & Catherine Cormack Wit: Thomas Eviston & Judy Fanning & John Cormack. 19 Feb 1846, Lissaroon, John Fanning & Bridget Purcell wit: John Toohy & Johanna Purcell. 14 Feb 1847, Killahagan, Thomas Fanning & Winifred Carroll wit: John Norton & Margaret Purcell. 10 Mar 1848, House, Thomas Stapleton & Mary Cormack wit: Edmund Cormack & Johanna Fanning. 7 Mar 1848, Killahagan, William Kennedy & Johanna Fanning wit: Michael Dempsey & Bridget Purcill. Feb 11 1850, Lissaroon, William Connell & Johanna Fanning wit: Michael Duggan & Margaret Hayes. 24 Jan 1856, Ballypatrick, James Connelly & Catherine Singer wit: Thomas Fanning & Judy Harrington. 21 Feb 1857, Annfield, James Houlahan & Catherine Fanning, wit: William Purcell & Johanna Kelly. Dispensation in 3 & 4 cons. 12 Feb 1861, Kill, Michael Magrath & Mary Fanning wit: Matt Staplton & Margaret Evistone. Nov 1866, Killahagan, Thomas Cooney & Bridget Carroll wit: Michael Collins & Catherine Fanning. 20 Feb 1868, Kill, Daniel Bourke & Catherine Fanning wit: Patrick Fogarty & Margaret Eviston. 25 Feb 1868, Clonismullen, Thomas Fanning & Ellen Ryan wit: James Fanning & Mary Quinlan. Feb 27 1870, Clonbeg, Cornelius Duan & Bridget Costello wit: John Fanning & Anastasia Costello. 7 Feb 1875, Killahagan, Denis Kavanagh & Catherine Fanning wit: John Kavanagh & Kate Grady. Feb 13 1876, Rathleasly?, John Shelly & Mary Ryan wit: John Nesbit & Margaret Fanning. June 12 1877, Lissaroon, Patrick Mullany & Ellen Ryan wit: John Mullany & Honora Fanning. Feb 10 1879, Ballinlonty, James Hoar & Anastasia Fanning wit: Phillip Egan & Johanna Fanning. *18 June 1879, Lisaroon, Edward Deavy & Hanoria Fanning wit: Michael Campion & Bridget Fanning. I am looking for information about an Edmund Fanning who died 26th January 1832. He is possibly the Edmund Fanning who leased land at Killmacorris, Parish of Drom, Tipperrary. His first cousin was a Joseph Lanigan. Edmund was struck with a stone which knocked him off his car. I would like to know more about Edmund and a possible reason why a rock was thrown at him. Any information about Edmund would be much appreciated. Thankyou in advance for any help. Unfortunately for researching there were quite a few Fanning families in North Tipperary at this time and Edmund a common christian name. So you can’t assume he is from Killvacorris in Drom. You might be able to find his being hit with a stone in a local paper of the time. That would probably involve a subscription. You could search the catholic registers of baptisms and marriages that are online free at registers.nli.ie Look in Drom parish. One thing you do know is that his aunt married a Lanigan so you may be able to track down your Edmund this way.These records are the originals and are not indexed so you have to trawl through them. 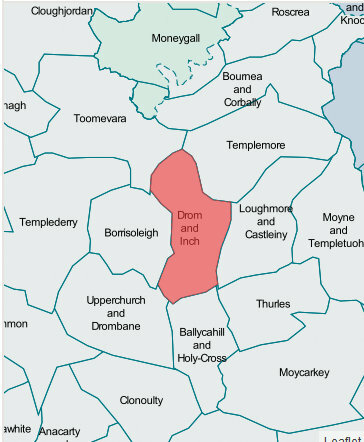 Rootsireland has all the parish records and actually has some Thurles ones that the national library doesn’t have so this site is excellent. It used to be ridiculously expensive to use but they have updated it and have some reasonable packages, for example 24 hour access. It is worth the money.You could enter Fanning and Lanigan marriage and you might get a place name! The early Irish records are very frustrating due to their lack of details like mother’s maiden name etc so it can be almost impossible to link families. Recently all the civil records have been put online again for free at irishgenealogy.ie These records are later mostly after 1860. They are free and have the original image attached in nearly all cases.